Successfully Added SATA HDD Multimedia Movie and Music Player to your Shopping Cart. 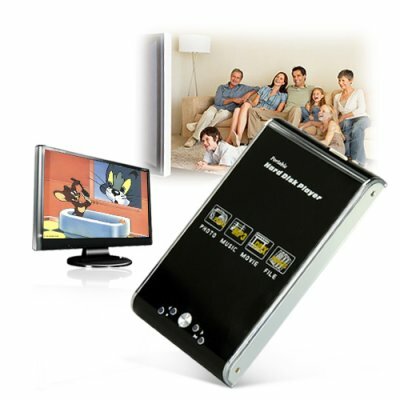 SATA HDD multimedia movie and music player that elevates your entertainment needs to a whole new level of experience. This awesome HDD enclosure enables you to combine and organize ALL your digital media files in to one single location, for easy access and maximum enjoyment. Get comfort in knowing where all your entertainment files are stored! Transfer all your downloaded media files, after which, you will be able to view them all on your TV. This HDD multimedia player is compatible with a variety of file formats including DivX and Xvid, as well as displaying JPEG pictures and playing MP3, WMA and WAV music files. The casing of the HDD media player comes in a durable shiny aluminium casing. In addition, for even faster access to your media files, you can insert your SD/MMC card straight to the side slot of the HDD player, and instantly access your files. This is certainly a beautiful HDD player to own. It comes with an attractive and simple navigational menu system, making accessing and navigating through all your digital media files within the HDD enclosure so much faster and easier. This SATA HDD multimedia player connects straight to your TV using the AV OUT. This model also comes with a VGA OUT which connects directly to your computer's display monitor. Finally, this portable hard disk player comes with an OTG host for quick copying to the hard disk, and is compatible with all popular OS including Windows Vista . The CVASQ-2008SA can also be used on your travels, thanks to its dimensions which lets it fit easily in your laptop bag. This model makes a great addition to your entertainment setup at home, and provides joy and happiness to any family or individual. The CVASQ-2008SA makes digital media come alive and is only available from the leader in direct factory wholesale electronics, Chinavasion. Hard disk drive (HDD) NOT included, the HDD you install must be formatted for the enclosure to be able to operate it. Do I have to format a hard drive before I can use it in this device? Yes, you need to format your hard drive first, them you can use with this device. How do I load my media files onto this HDD multimedia player? Just connect it to a computer with the included USB cable. You can drag and drop your files onto the hard drive. How do I connect this device to a monitor or a TV? To connect to a monitor, use either the RCA or VGA depending on the monitor or TV you are connecting to.